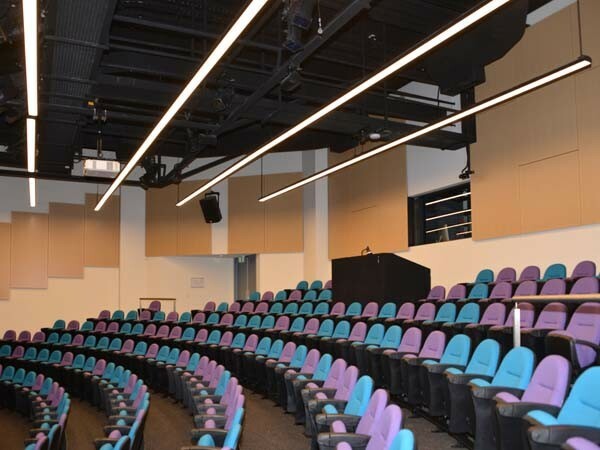 SUPACOUSTIC NCK floating acoustic panels have been effectively used in the refurbishment of The Playhouse Theatre at WSU Kingswood Campus in NSW. The upgrade of this small theatre to suit theatrical performances meant that the quality of the acoustics in the space needed careful consideration. The university’s Capital Works design team were given a tight budget so therefore needed to find an effective acoustic and decorative panel lining solution, which could easily be applied to an existing surface. Find out how the SUPACOUSIC NCK acoustic panels provided the answer. The aim was to make this space ideal for intimate music and theatrical performances for an audience of up to 220 people. The acoustic panels have been placed on the walls around the three sides of the seating area to dampen noise reflected off the wall surfaces. SUPACOUSTIC NCK acoustic panels offer an economical high acoustic performance, which has been fully tested and is totally guaranteed. This makes this panel lining system ideal for refurbishments of this type that need to effectively address noise reverberation without a high price tag. In this project a high profile, perforated panel finished in SUPAFINISH Fusion Maple concept veneer has been used. The perforated pattern is soft and combined with the warmth of timber achieves a welcoming intimacy in this small space. The SUPACOUSTIC NCK acoustic panels come in standard sizes and profiles, and are supplied in a complete pre-finished kit. They can be installed over and around virtually any existing surface or existing fixture making them exceptionally easy to specify and install. For this project the university wanted to use a SUPAWOOD preferred installer. SUPACOUSTIC NCK acoustic panels have now been used successfully in many of WSU’s refurbishment projects.